Okay, I’ve been getting lots of pressure from friends to post this, so here it is, my method for cooking fillet steak with bernaise sauce and French fried potatoes. It’s not particularly revolutionary, but it is awesome and pretty dependable. Try it out and let me know how it goes. I’ll start with the béarnaise. This method is not the classical method, but it works fantastically and I’m rather partial to it, since learning it from my sister (cheers Alacoque!) who in turn learned it from Maureen O’Brien, the now deceased wife of my also now deceased godfather Mahon O’Brien. The O’Briens ran the well regarded Vale View hotel in Avoca for many many years, and were truly ahead of their time with regards to the food served in the restaurant there. Anyway, this is Mo O’Brien’s method, and it’s a corker. 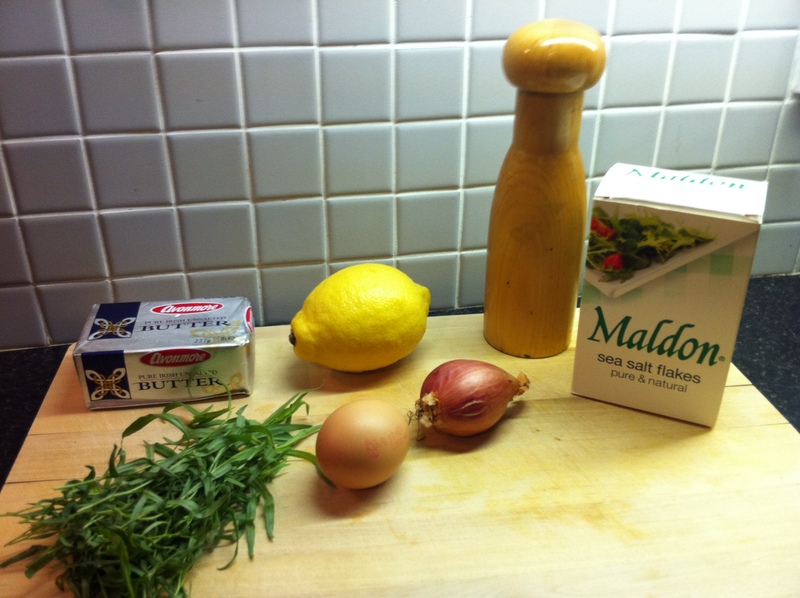 First, here are the ingredients: Tarragon, unsalted butter, a shallot, salt, pepper, an egg yolk and lemon juice. Bearnaise is one of the classic ‘-aise’ sauces, along with mayonnaise and hollandaise, all of which are emulsified sauces — made in a way that allows normally immiscible fats and acids to mix, usually by using egg yolk as a binding medium. 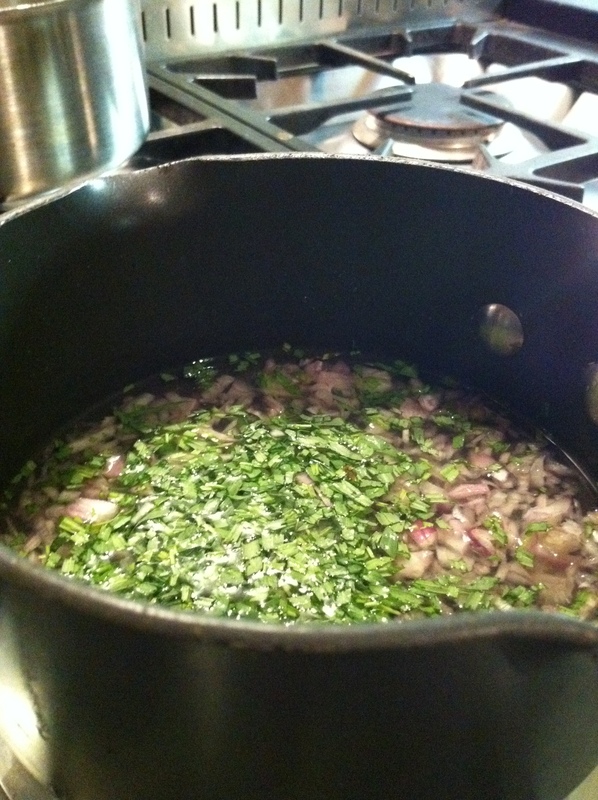 In this method, you finely dice a shallot, along with a generous handful of tarragon herb, before adding them to a small saucepan, and covering them with a splash of water. To this you add a squeeze of fresh lemon juice, and some decent quality salt and pepper. Taste the water at this point, to check the acidity – it should be quite sharp because you’re going to add a lot of butter later — and set it to simmer gently until the water is cooked off. This creates a flavour base, gently cooking out the rawness of the shallots to create what at this stage should be a slightly harsh, lemon-flavoured herby sludge. Leave this mixture to cool, before adding an egg yolk. This is the crucial stage –if the mixture is hot when you add the egg yolk, it will start to cook and you’ll end up with scrambled egg rather than a sauce. Basically, you want your sauce base to be warm enough to slowly melt butter, but not actually hot. Take a generous quantity of unsalted butter and dice it into inch-sized cubes. Place your small pan into a larger saucepan containing boiling water, but make sure the bottom of the smaller pan isn’t actually touching the water. 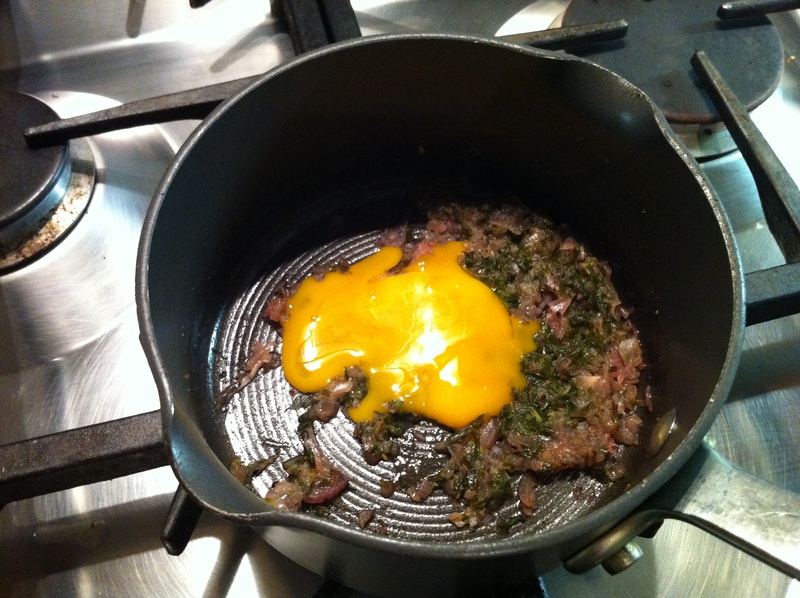 The idea here is that you gently heat your sauce base, while whisking in butter one bit at a time. If you do this carefully, using enough heat to warm the sauce but not get it too hot – which is what the water bath is about – then as the egg yolk gently cooks, it will incorporate the lemon acid in the sauce with the unsalted butter. Once it starts to take, you’re away. You can whisk in more butter to get the consistency you like, all the way from thin to thick and mayonnaise like. Taste it to adjust the seasoning. Your sauce is done and will keep for a couple of hours happily at this stage. Next, to the chips. This isn’t rocket science really – you want the basic twice fried chips. The key to really good chips is the kind of potato you use – not all spuds are suited to all uses, and for great chips you really want something like a Maris Piper potato – these have a high enough starch content that you can get chips that are lovely and crisp on the outside and soft and fluffy inside. It’s really worth tracking these down if you’re going to have a go at this. I basically just hand cut mine to a uniform size, rinse them thoroughly to get as much starch off them as possible and then dry them using paper towels, to get as much water off them as I can. Next, they go into the deep fat fryer (in batches, if they won’t all fit in one go) so that they basically stew in hot oil for a while. When they are cooked through, but not crisp, I take them out, drain them off and let them cool down. They can hold at this stage for a couple of hours. 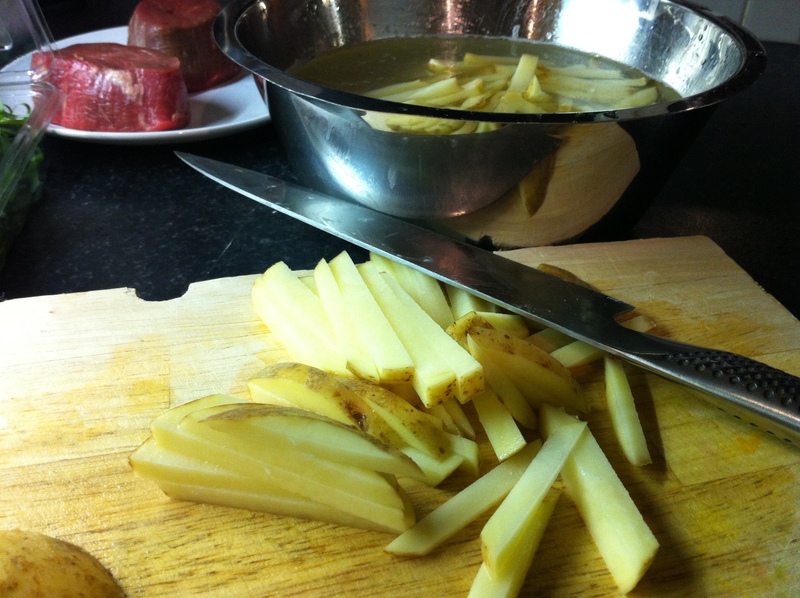 Just before serving, whack up the heat on the fryer and put the chips back in to crisp up. The effect is totally worth it. Try it out. Finally to the main event, the meat. In these pictures, I used a couple of 8oz fillet steak sourced from a local butcher near where I live who really knows his stuff when it comes to meat. It’s aged for 28 days and is really fantastic quality. For a long time, I didn’t eat meat, and now I tend not to be interested in eating it unless it’s of very high quality. 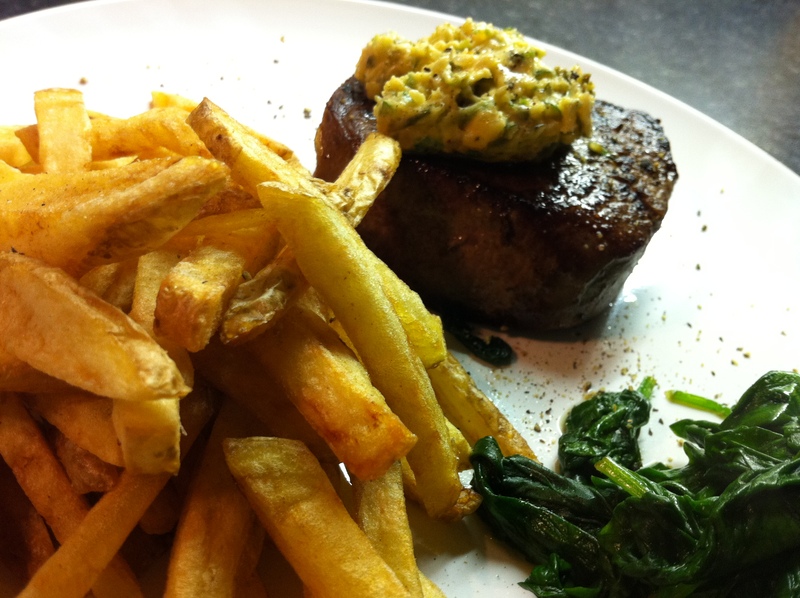 Cooking fillet steak isn’t hard – the basic principal is that less is more. I heat a non-stick pan until it’s pretty hot, and then add some rapeseed oil – it’s a good quality oil that can take a high heat without burning, unlike, say, olive oil which doesn’t like high temperatures. 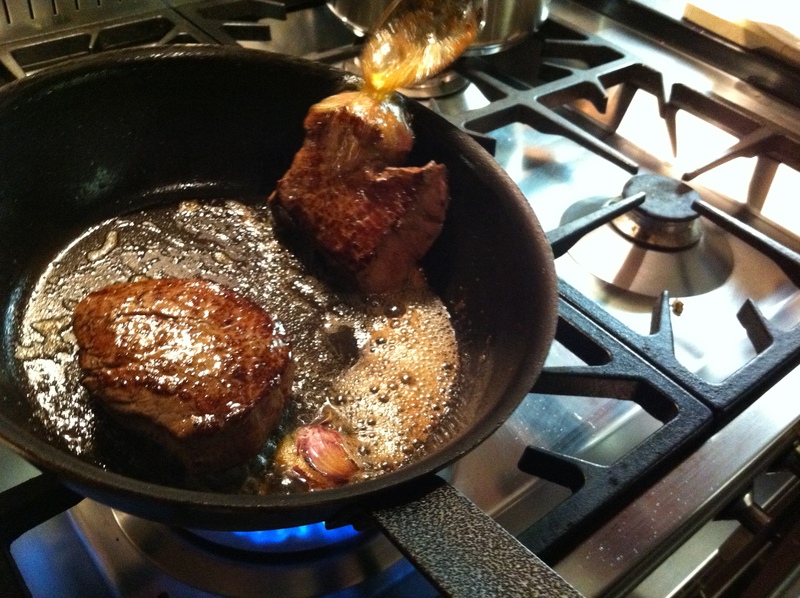 Once the oil is smoking, I add my fillets, and leave them be for around a minute. Before I turn them over, I add a generous knob or two of unsalted butter to the pan, along with a couple of cloves of garlic which haven’t been peeled, but have been lightly crushed to break them open. As the butter melts and foams up as it hits the hot oil, I turn the fillets over and baste them with a spoon as they cook. After a minute or so on the other side, I flip them onto their side and cook them for a further minute or two on the sides, trying to get them evenly browned. 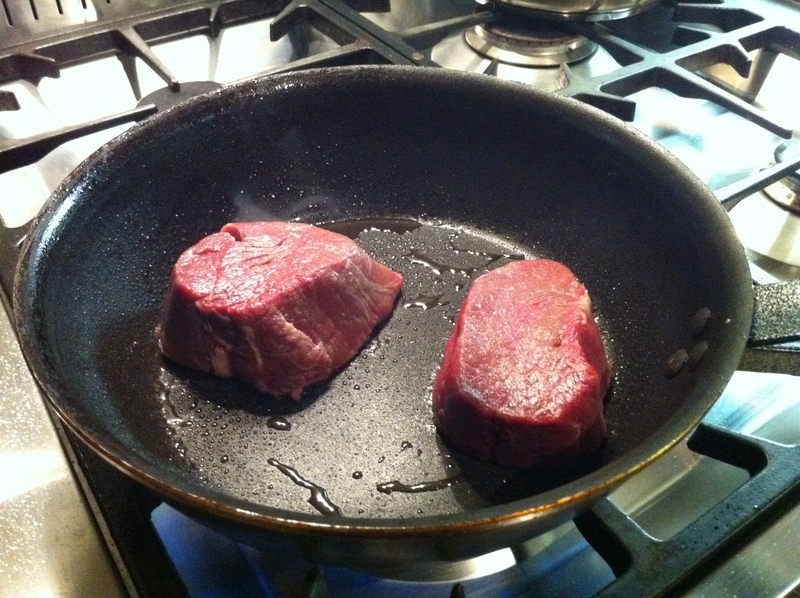 This gives a good medium rare temperature, and so I take them out of the pan to rest for a few minutes. And basically, that’s it. Thanks for the link, and I’m flattered that someone tried out the recipe and then blogged about it! 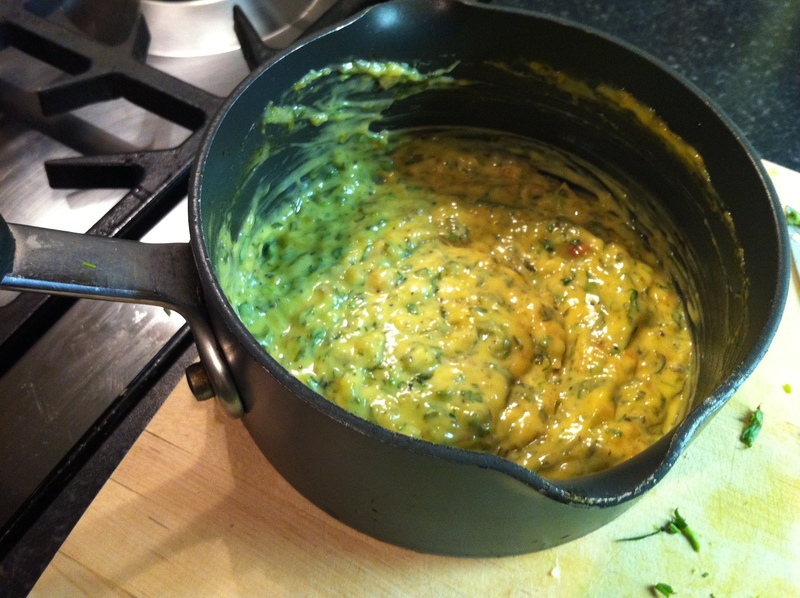 The first thing I’d say is that my recipe is not a classic bearnaise – it’s a tweaked personal version. I actually prefer mine – I’ve been served some really uninspiring thin and watery sauces in restaurants under the name bearnaise and they just weren’t that nice. I looked at your picture of your sauce and it doesn’t look quite right to me. The finished texture should be thick and creamy, almost like a mayonnaise. If you look at the first picture on the blog entry above, you can see that that sauce is very thick. This was actually a mistake – I finished my sauce and then put it in the fridge without thinking, and it started to solidify as the butter in the sauce cooled. The finished sauce consistency should be what you see in the last picture where it’s still in the sauce pan. Looking at yours I’d guess it didn’t emulsify properly. The trick is to follow the recipe exactly and then only add your butter in small amounts at a time. It shouldn’t matter whether it’s clarified butter or normal unsalted – either way you should only use a small bit at a time and wait for it to thicken over the water bath before adding more. If it’s too thin then I would guess that either there isn’t enough egg yolk or it didn’t emulsify properly. It’s worth working on sauces like this, because they are so versatile. You can use the exact same technique to make great hollandaise sauces for Eggs Florentine or Eggs Benedict. I was actually out for breakfast the other morning and got an amazing eggs benedict where the chef had effectively made the same sauce as in this recipe, using a little mint instead of tarragon – it worked really really well. I was blown away by it. Anyway, thanks for having a go at it, and please try again – you won’t regret it if you get it right. Thanks for your advice! I will try it again and let you know!! I just wanted to thank you so much for putting up this recipe. I am one of Mo and Mahons granddaughters and it was surreal having this come up in an inpromtu google search. Really made my week, so thanks again!